Superbowl weekend was a busy weekend here at the Hatcher-Miller household. On Saturday, we started off our morning with a three mile run (yikes! I know!! Just typing that makes me a little queasy!!). We followed that up with a three and a half hour nap. Anyone who knows us, knows how much we love a good nap. 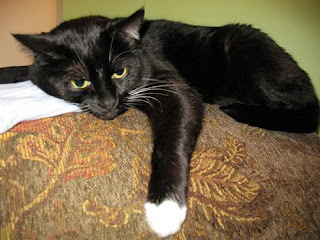 Of course, we had Ana, Lita and Domino snoozing with us, but then we all got up and got busy. The three critters got busy on their next round of napping, while Kenney and I started running errands to gather up wedding invitation supplies. Luckily for us, we already had done a bunch of the prep work like cutting out all the mats that we are going to use and pre-cutting the envelopes... yes, all of our paper product for the wedding is going to be/has been hand-made by the bride and groom! We spent the rest of Saturday assembling the invitations and envelopes. Then Sunday, we started fresh on the invitations again... we are making invitation packets of information for all of our out-of-town guests. All of Kenney's family is going to be coming in from out of state and are planning on making our wedding in Williamsburg a vacation for them. So, we thought it would be great if we put together some basic information about the area so they have a starting off point for their planning and preparations...plus there is a really great surprise for everyone that we picked up a couple of weeks ago when we were in Williamsburg doing wedding planning stuff that I think everyone will love!! 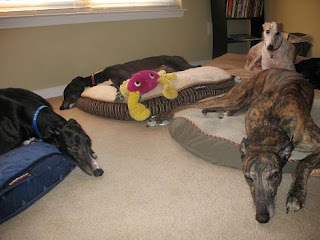 Also on Sunday, we went over to our crazy greyhound friends' house. 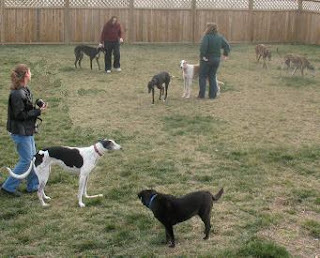 They were having a Superbowl party and a couple of other greyhound people that we have hung out with a couple of times were down from Fredericksburg with their two pups and a foster pup named Chatham Blue. 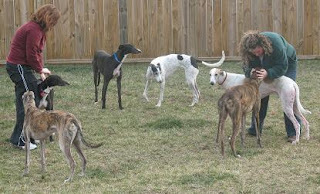 In all, there were 6 greys at the gathering, including Ana. 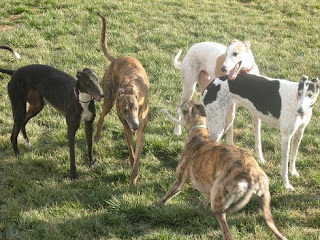 It is always so amazing to see a group of greys running around having fun!! Chatham Blue goes to his forever home in a few weeks, but Ana and he created quite a bond very quickly... too bad we didn't get to foster fail with him!! 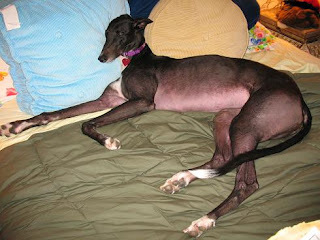 =) Ana seems to have an afinity for the other black greyhounds! Blue was very timid, but he was very sweet! He really wanted to play, but I think he was a little overwhelmed by the vigor of the other greyhounds at play. 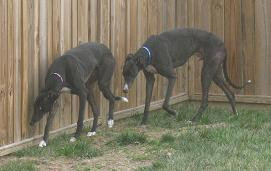 He and Ana had fun though- he followed her around the yard some, much like she does me! The humans are Trina, Kristin and me. The dogs are Dana (the cow-colored grey next to her mommy, Trina), Shiloh (the black one next in front of Dana, also Trinas), Ana is the black one a little farther back standing next to Lucas (the fawn and white one next to his mommy, Kristin), I am petting Blue (the other black one), and Stella and Hank are the two brindles racing off to the right (Stella is Kristin's, and Hank is soon to become Zeke... I know, I feel the same way about that name.). I want to keep them all!! 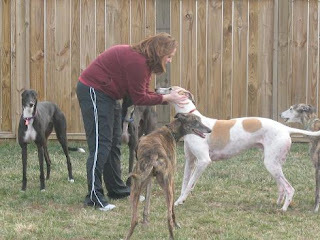 That is Ana to the left, Hank (Zeke) is the brindle in front of me, you can see Blue near my legs, Lucas is the one I am rubbing ears on, and Stella just made it into the picture. She is definitely a barker!! I love playing with all the greys! Annie, Hanke, Stella, Lucas and Dana... Blue was hanging out in the background. Blue, Ana, Hank and Lucas - Tired pups!